Who needs us? Everyone! Who uses us? Hospitals, doctors, lawyers, retired professionals, medical records & medical billing companies, payroll agencies, human resources, manufacturing facilities, colleges/universities, insurance companies, municipal & state government agencies, US government entities, retail credit card processing centers, hospitality & food service industries, pharmacies... Protect your own private information, protect your clients' privacy, and protect your employees' privacy. We service all document destruction needs. No job is too big or too small. Document Shredding - Your documents are securely destroyed on-site using a 'no touch' process. Regular Route Service – The customer has any number of free totes for paper storage, and we stop by and shred on a regular schedule. You are never locked into anything, however, so if the tote fills up before your scheduled shredding time then just give us a call. Call Ahead Service – The customer has any number of free totes for paper storage. The customer then calls us each time they want to schedule a pickup. One Time Document Purge – Often a business or individual requires mass shredding of older documents. Just give us a call or e-mail us for a fast quote. Document Retrieval - We will retrieve specified records and take them to you any time you want us to. 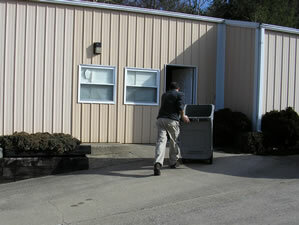 Drop Off Service - You are welcome to bring your sensitive paper documents to our facility for destruction. Please call for an appointment. Community Shred Days - Free community shred days are currently offered in May, June and October. Check back for more details.